Objectives: The Fundamentals of Laparoscopy Surgery (FLS) is a validated program endorsed by SAGES to teach and assess laparoscopic technical skill. One of the common criticisms of the FLS program, however, is the necessity of the presence of an experienced proctor, to set up the system, as well as to provide assessment and constructive feedback. While the FLS tasks are traditionally performed in black boxes, advances in technology have allowed for the creation of these tasks in a virtual reality environment. While performing FLS tasks on a VR simulator has some potential advantages, such as eliminating the requirement for an expert to be present for set-up and assessment, or providing computer-generated instantaneous assessment and feedback, performance assessed by the virtual reality FLS tasks has not yet been demonstrated to correlate with the performance parameters used by FLS. The purpose of this study was to assess the validity of a virtual reality (VR) simulation model by correlating it with the extensively validated FLS parameters. Methods: 15 surgeons with varying levels of laparoscopic experience participated in this study. Each participant completed 3 FLS tasks (peg transfer, pattern cutting and endoloop) on the VR model (LapSim®, Surgical Science, Gothenburg, Sweden), as well as on the FLS model. The order of task completion was kept consistent across participants and the first simulation model utilized by each participant was randomly assigned using sealed envelopes. FLS scores for each task were recorded by an expert, and LapSim automatically generated assessment metrics. From these assessment metrics an economy of movement and error score were computed. Correlations between the final FLS score for each task and the equivalent economy of movement, error, and time scores generated by the VR simulator were assessed by Spearman’s correlation coefficient. Results: 10 out of 15 participants completed the peg transfer task on both the FLS and VR model. 15 of 15 participants completed the pattern cutting task on both models and 10 out of 15 completed the endoloop task on both models. Significant correlations were observed between the normalized FLS score and the time and economy of movement score on the peg transfer task and pattern cutting tasks recorded by the VR simulator (p<0.05). For both the peg transfer and pattern cutting tasks, however, the VR error score did not correlate with the normalized FLS score. Finally, there was no significant correlation between the FLS normalized score and either the time, economy of movement, or error metric generated by the VR simulator for the endoloop task. 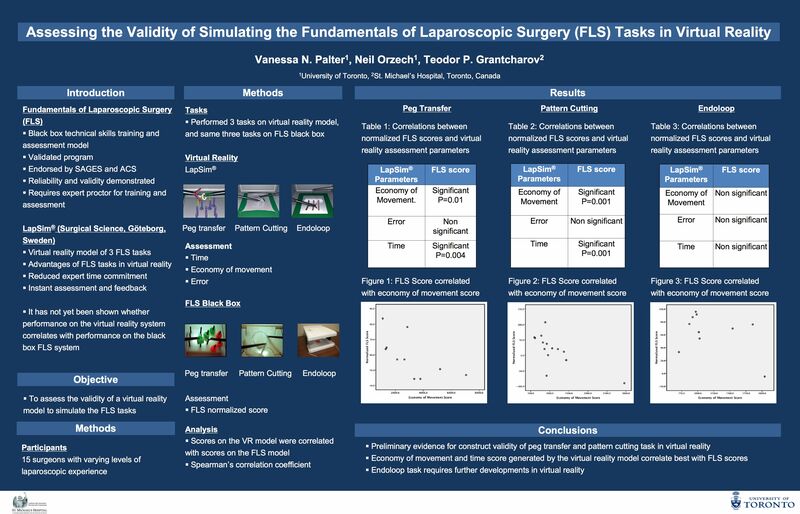 Conclusions: This study demonstrates preliminary evidence that the LapSim VR model designed to simulate the FLS peg transfer and pattern cutting tasks provides a reliable and valid assessment of laparoscopic skill. It can be utilized by surgical residents to practice basic laparoscopic skills, and the assessment parameters can be used as constructive and objective feedback. This has the potential to reduce the expert time commitment currently required for FLS training and assessment. Further developments to the VR modeling of the endoloop task are required.